Gili Madang is a small island off of the north coast of Sumbawa close to Moyo Island. There are a number of sites here that are very different from each other. A reef wall around a kilometre or so southwest of Madang boasts a good number of sharks. There is also a rarely dived part of Northern Sumbawa that is refered to as the "Car Park". 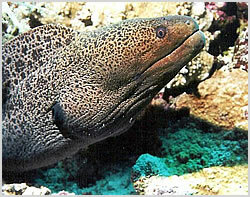 This dive site has a series of rocky coral terraces that house vast numbers of Giant Moray Eels.